Believe it or not, the ESIP Summer Meeting is quickly approaching! We are very excited to announce that registration is now open. We encourage you to continue to contribute session proposals. This week we will kickoff our 2019 Webinar Series, which follows this year's theme, “Data in Action: Increasing the Use and Value of Earth Science Data and Information.” Join us this Friday (3/22) at 12:30 pm ET to see ESIP's sponsor representatives from NASA, NOAA, and the USGS, discuss how their organizations contribute to increasing the use and value of Earth science data and information. Finally, check out this new ESIP Partner Highlight featuring the Rolling Deck to Repository (R2R) Program. 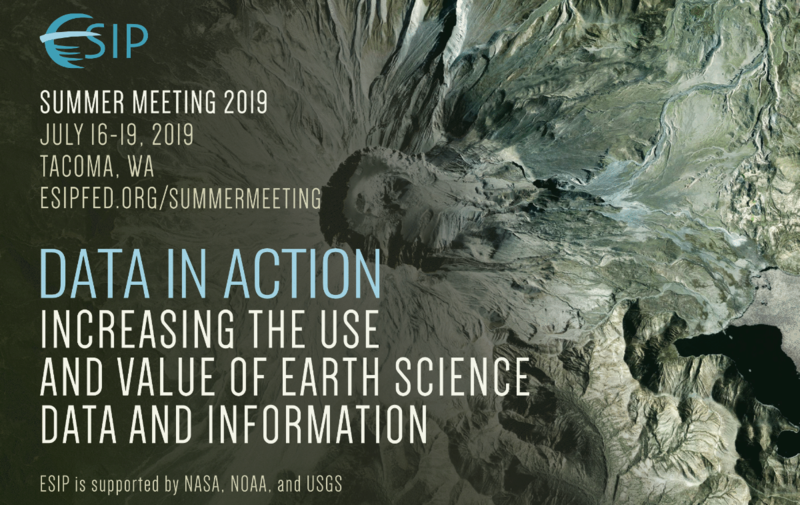 ESIP's 2019 webinar series explores activities within and outside of ESIP that contribute to increasing the use and value of Earth science data and information by addressing three main questions: How do these activities contribute to increasing the use and value of Earth science data and information? What are quantitative and qualitative ways that can be used to assess and measure this use and value? And, what are the challenges and opportunities that currently exist in further increasing the use and value of Earth science data and information? The first 3 webinars are listed below. For more details, including connection info, see here. The Rolling Deck to Repository (R2R) program provides fleet-wide management of underway data to ensure preservation of, and access to, our national oceanographic research assets. Learn more about R2R and why they participate with ESIP in this Partner Highlight. ESIP IQC members presented in a ARDC TechTalk Webinar held on March 1st. You can check out their presentations at the YouTube links below. develop open source technical infrastructure that enables research, adoption, and evaluation of sustainable agricultural practices. Learn more and apply by 3/22 here. To learn more, see here. Apply by 3/22. For questions, contact internship@dataone.org. As part of the GOES-R Education Proving Ground, the Cooperative Institute for Meteorological Satellite Studies (CIMSS) is holding a Virtual Science Fair to encourage students (grades 6-14) to work with GOES-16 or GOES-17 data to investigate weather and natural hazards. Prizes include official GOES-T launch invites and coaches of the winning teams will have their travel paid to AMS Centennial meeting. Learn more here. ESIP Staff, along with several ESIP Lab teams, were able to take part in a previous SGCI Bootcamp and found the experience to be extremely valuable. Learn more and apply by 3/22 here.